SARASOTA COUNTY – Sarasota County's prescribed burn team has burned more than 7,000 acres on county lands this fiscal year in an effort to help prevent the spread of wildfires and protect property, people and the environment. Since October 2014, Sarasota County Fire Department mitigation specialists have conducted 53 prescribed burns and have already surpassed their annual goal of 6,000 acres. These burns, conducted by highly skilled staff members with specialized training, mimic natural fire conditions and help prevent catastrophic wildfires by reducing hazardous conditions. 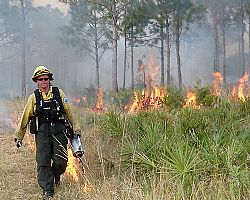 Fire is also essential for maintaining the biodiversity throughout many of Florida's habitats, according to Jon Robinson, division manager of natural area parks and preserves. "Along with reducing the threat of wildfire, regular prescribed fire maintains a healthy environment necessary for the survival of native wildlife like the gopher tortoise and the Florida Scrub-jay," Robinson said. The county's team is one of more than 30 different entities authorized by the Florida Division of Forestry to conduct burns within Sarasota County. For more information about the county's prescribed burn program, visit www.scgov.net or call the Sarasota County Contact Center at 941-861-5000.